One of my favourite things to do is take a homey classic like chicken and rice, and inject a current twist. I know I’m not alone in this! Here, I’ve created a riff on the flavors of the ubiquitous ramen bowl, but with your momma’s foundational chicken and rice. Heat oil in a large pot over medium-high heat. Add chopped ginger, onion, and miso. Sauté four minutes. Add mushrooms and sauté two minutes. Add stock, chicken, and bok choy. Reduce heat and simmer eight minutes. While soup simmers, prepare rice according to package directions. Stir rice, soy sauce, and salt into the soup. Cook four minutes or until bok choy is tender. Remove from heat and stir in lime zest and juice. 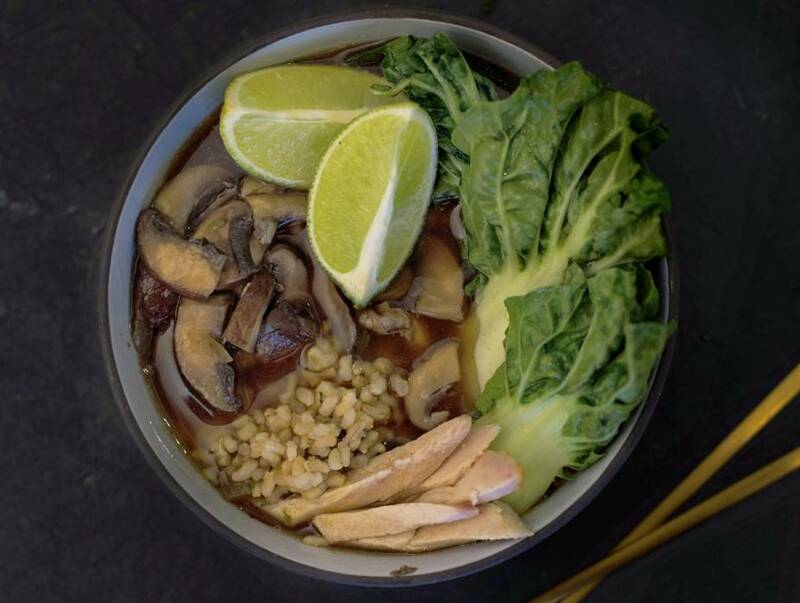 Prepare in bowl by layering mushrooms, bok choy, chicken, rice, and any extras. Pour in broth. Garnish with toasted sesame seeds and scallions.